The minesweeper HMS Bronington, formerly commanded by Prince Charles, has been left to rot since the Historic Warships collection, of which she was part, was disbanded in 2006. On 17/03/16 she sank at her moorings in Birkenhead's West Float. Just stumbled across this photo. What a sad state of affairs. I was a POMEM(M) on Bronington during her last two years, and my son was christened on her. Interestingly enough, his is the only name on the bell. Previous bells had been damaged during plating and inscribing. I never did get round to taking my family to see her when she was parked up in Manchester. It is a real pity that no more has been done to preserve her. Especially, as has already been suggested, by asking volunteers from the Prince's Trust to develop skills whilst keeping Bronington afloat. I understand that the bell and the ship's wheel were presented to HRH on the occasion of his 40th birthday. I have no idea where they would be now. I would like to at least get a photo of my son together with the bell. Thanks for your comments. It's sad how she's been allowed to decline from a well-kept museum ship to a complete wreck. 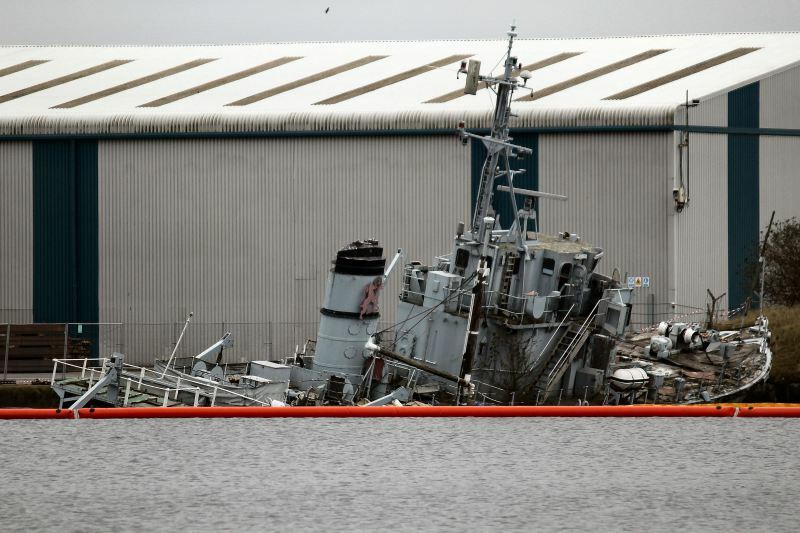 People say that after the Historic Warships collection was disbanded she was deliberately placed in a disused part of Birkenhead's West Float so that her inevitable sinking wouldn't cause any inconvenience to traffic. Thanks very much for this photo Barry. That's the bitter end of her then. Another loss to the nation. The Prince's Trust might have seen fit to use the vessel as a training 'vehicle' to teach suitable young people some basic skills. One of their aims being to offer short courses in training and experience in a specific sector to help young people get a job. Plenty of skills required to maintain Bronington. I also note, wryly, that the buddleia tree is unlikely to survive salt water root immersion! I THINK THE ANCHOR CHAIN COULD BE MADE OF BRONZE!!!! This photo has been shown 4,043 times since it was added to the site.